Mobile phones can cause interference on microphones used in the Houses of the Oireachtas. 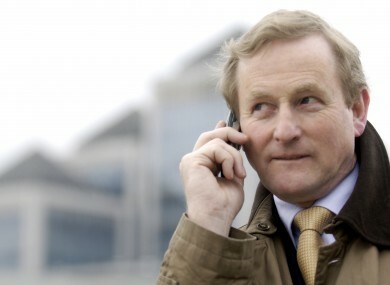 Taoiseach Enda Kenny using his phone in a suitable outdoor setting away from Dáil microphones. TDS AND SENATORS have been asked to not use their mobile phones in the Oireachtas as interference from the devices has repeatedly disrupted proceedings. The issue has also been earmarked for discussion by the Committee on Procedure and Privileges. In an email seen by TheJournal.ie, Ceann Comhairle Seán Barrett instructed members of the Oireachtas to turn off their phones or put them in flight mode when entering the House. He said that this is the only way of “insuring [sic] that your contribution in the chamber is both heard and is usable [by the media]“. The warning is heard frequently in the Dáil and Seanad chambers when a mobile phone interferes with the speaker’s microphone. The issue of mobile signals interfering with live feeds from the Oireachtas is often noted at the start of Committee meetings, where those in attendance are instructed to turn their phones off. Such interference can render the recordings useless for radio and television broadcasts as the speaker is unintelligible. While their UK counterparts were given permission two years ago to tweet from the House of Commons, Irish TD and Senators are theoretically banned from using phones in the Chambers under their Code of Conduct. A mobile phone’s radio transmitters can interfere with some microphones leading to the distinctive pulsing buzzing noise. TDs and Senators are often spotted using their phones while Chambers are in session. However, according to a tweet by Senator Jillian van Turnhout, this will only affect the microphone if the phone is placed right beside it. Email “TDs and Senators instructed to stop using their phones in the Oireachtas”. Feedback on “TDs and Senators instructed to stop using their phones in the Oireachtas”.